Well, we’re movin’ on up!! 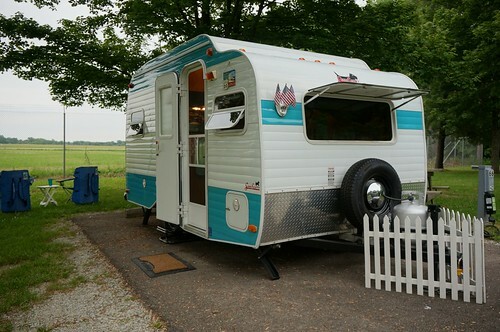 As indicated in my previous blog post, we are selling our Serro Scotty HiLander travel trailer. We are having growing pains (or at least, the beginning of them), and it’s a good time for us to move on up…to a bigger travel trailer! 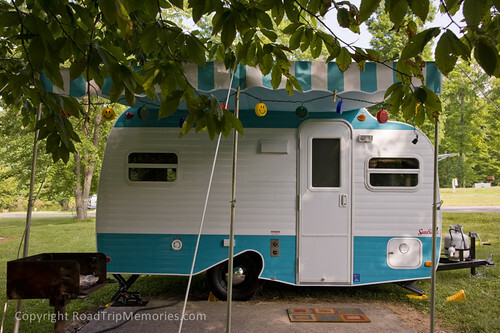 We started out with our first travel trailer being a small T@B, which was good for a couple, but yet we actually quickly outgrew that, even without additional family! After buying the T@B in September 2009 and camping throughout the fall and winter into 2010, we realized that while we loved camping and the T@B, it was too small to be comfortable (yeah, I know it’s not roughing it compared to tent camping, but in the RVing spectrum, it is!). 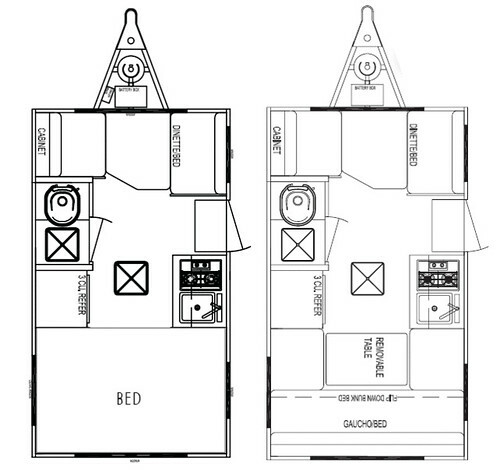 After researching options that would suit us (roomy, with a separate bed and dinette, bath/shower, etc. ), we settled upon the 2010 Serro Scotty HiLander, which fit all the criteria we wanted and was retro and very unique! It was (and still is) a great little trailer, but there is a certain irony about buying a small camper and within a few weeks discovering that there will be a grandchild coming (our first!). We knew the Scotty would have some room for him or her because of the two dinettes, both converting into beds, so no matter. Sure enough, a year later, in June 2011, we took our 4-month old grandson on his first camping trip. Being a happy baby, he loved everything…so of course, we didn’t know whether he’d grow to love camping. We hoped he would, and his enthusiasm for our little Scotty grew as we continued to take him camping (or even sleeping in it at home too – come on, RVers…we know you do too…). As he became mobile throughout 2012 and started getting into everything, we decided to hold off camping with him for a while. Obviously, kids don’t always “settle down” for a while, but he was at an in between time where it was hard to keep him from getting into everything, so he was relegated to driveway camping (subsequently referred to as garage camping when we built a garage suited to house the Scotty). Fast forward to 2015. Much better weather than 2014 – so far, not as much snow or subzero temps afforded us the ability to get the Scotty out a couple of times. Still a bit chilly to take a young child (he’s almost 4 now), so it was just Pat and me. And as we found out last summer, we are expecting grandson number 2 in March! So our thoughts this trip revolved around envisioning us and two little guys in the trailer. Pat and I were feeling a bit crowded ourselves…not to mention adding my grandson (this is going to be the year he finally gets to resume camping with us!). But now, to add a baby to the tiny trailer too? I just couldn’t imagine how we were all going to fit, plus our stuff…and we don’t even bring that much! But kids and babies just necessitate so much stuff of their own. As an aside, since becoming RVers, we have also thought much more about our future retirement plans, and whether we would spend them fulltiming or part time/snowbirding / extended traveling. Either way, we want the flexibility to see more of the country than we can now and some sort of RV will be a part of that experience. Most of our visits to RV shows involve looking for the rig of the future, and ironically, we just made several visits to the January RV show looking mainly at rigs for that purpose. 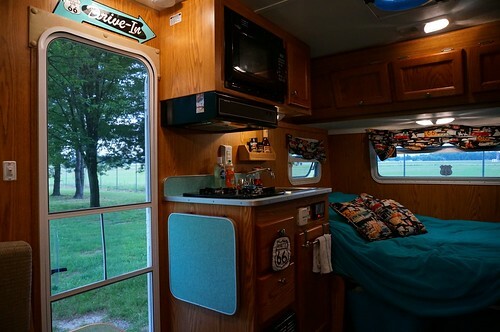 On the way home, I had the idea of updating to a larger travel trailer now…not as large as the one we’d think about in the future, but large enough to comfortably accommodate us, the grandsons, and even my daughter if she’d like to join us. Too bad, we hadn’t looked at too many in that size range at the shows. I didn’t say anything to Pat about it, and then he suddenly posed the very question to me! I laughed and told him I was thinking the same thing! As we talked about it, we knew that because we’re debt free, and in a fairly frugal mode, we’d not spend alot of money or incur too much debt. Debt makes me really bristle!! So we needed something fairly inexpensive and even more so, that we would sell our Serro Scotty HiLander. We absolutely adore that trailer (and I’m sure many RVers know this feeling of attachment well). We had it customized to suit our imagination, and even built a garage with dimensions that allowed it to fit inside, protected from the elements. But to justify the upsize, I need to sell it to reduce the new loan, and to minimize maintenance, insurance, etc. Just can’t see having two trailers. So here’s hoping that there’s a buyer out there to LOVE our Scotty as much as we do. So on to the new trailer. We really struggled with the idea of a generic box, but when it comes down to it, it’s going to be the memories and experiences – the family time together – that are most important. We still love the cool factor of our Scotty and always will, but we need to move up and be comfortable. We looked at many brands, dealers, styles, etc. and found a layout that we liked and will work for us. 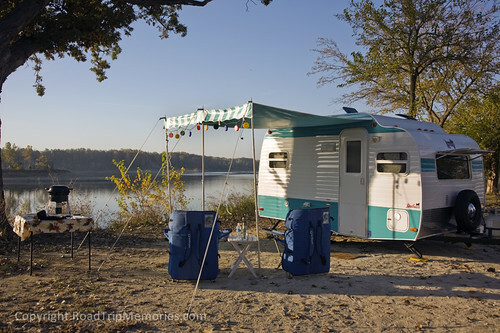 As to brand, the Shasta is an iconic brand, though the trailer itself is modern in style and design, as well as standard RV materials. We settled upon the Shasta Oasis 25BH model, which we ordered from Mt. Comfort RV – great working with them and negotiating on a good price. This is the same interior fabric, countertop and floor materials as we selected. The only differences from this model and the one we ordered, are that we added the following options: a full top bunk, instead of the single; oven, exterior shower, and aluminum wheels. Our new Shasta Oasis should arrive in late March or early April, so for now we’re not camping (yeah, we do camp in winter and enjoy it!). And the irony is that the weather this winter isn’t as bad as last year’s Polar Vortex and constant snow, which scarcely enabled us to camp. Change can be tough in some ways, but great in others. We’re sad to see the Scotty go, but know its new owners will enjoy her very much. We’ll enjoy fun times with our grandsons in the Shasta Oasis…and it’s always best to enjoy life, no matter what! 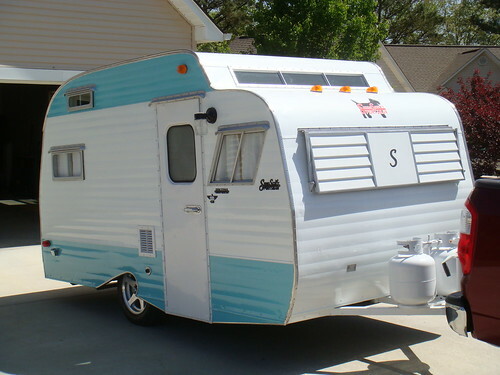 Due to a growing family tree (one grandson now and his little brother is coming soon), we are selling our beloved Serro Scotty HiLander and upgrading to a larger trailer with a bunkhouse, etc. 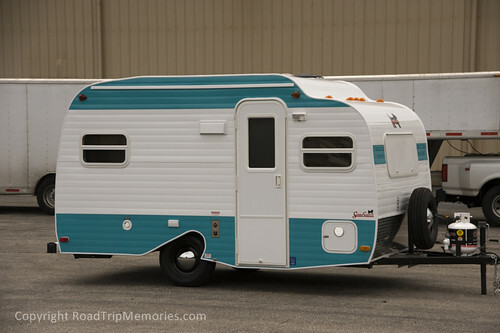 We just ordered a 2015 Shasta Oasis and are very excited to get it. That said, if I could keep and maintain two trailers, we’d keep the Scotty…but we’re working toward early retirement, so it makes more financial sense to sell. So, we are looking for a good home for our Scotty. 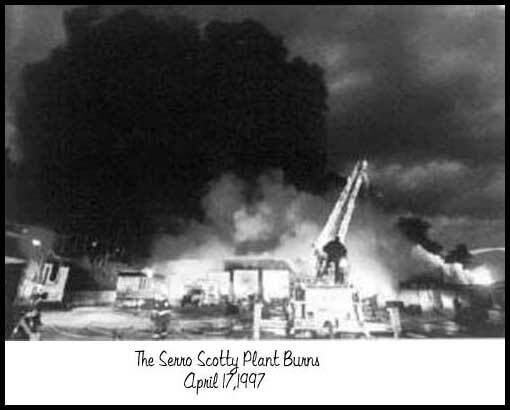 At the bottom of this post is the standard information from Serro Scotty’s website with regard to the HiLander. Even though this model is currently listed on their site, the Serro Scotty HiLander has not been manufactured since 2012. 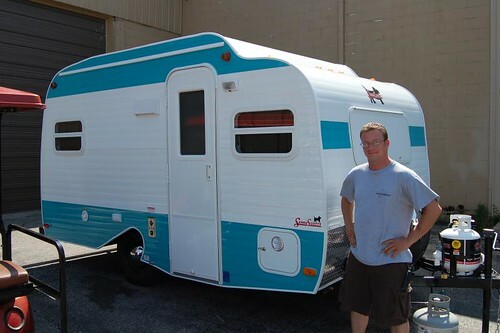 We ordered our 2010 Serro Scotty from Kerola Campers in April 2010 and picked it up in June 2010 from the factory, Sierra Interiors in Bristol, Indiana. Here is a link to photos we took that day during a tour with the warranty manager, John. These photos will give you some insight as to the construction. When we ordered it, we requested a few changes to the interior materials to make it look as retro on the inside as the outside. 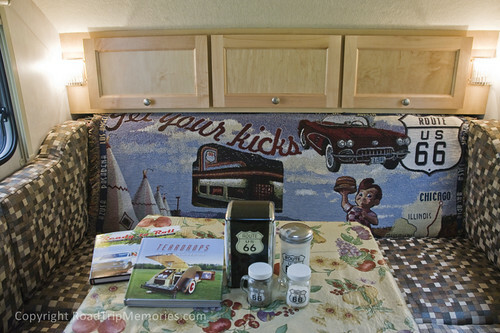 We selected a neutral fabric for the seat cushions, because we swapped the standard beige curtains for ones we had custom made with a Route 66 theme (fabric called Historic Highway by Alexander Henry). We also had the curtains made with room darkening / blackout fabric to prevent fading from UVs, as well as to allow us to sleep in late if we want to! We requested black & white checkered floor, as can be seen in the photo of the front dinette below. 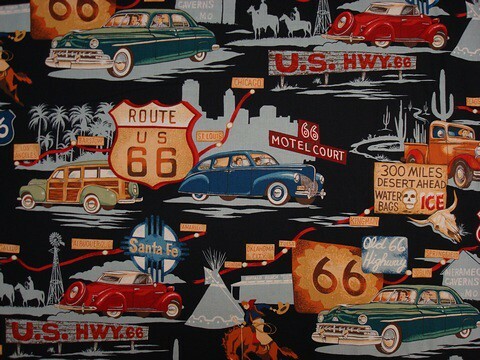 Here is a closeup of the fabric, Historic Highway, used for the curtains and pillows. 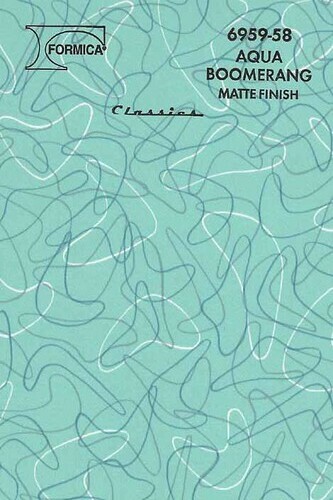 We also requested aqua “boomerang” by Formica and aluminum trim for the sink and dinette countertops. Our Serro Scotty is the floor plan on the right, which is the model that has a large U-shaped dinette in the back (rather than a bed). 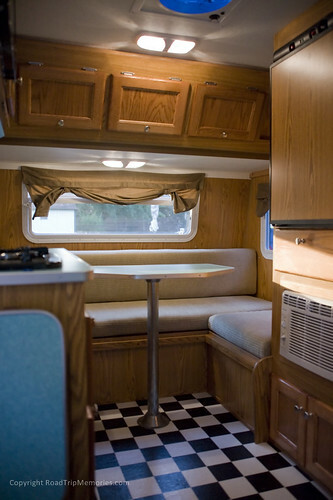 Of course, the dinette converts into a FULL bed, and we have actually primarily kept it in that configuration, rather than switching back and forth. 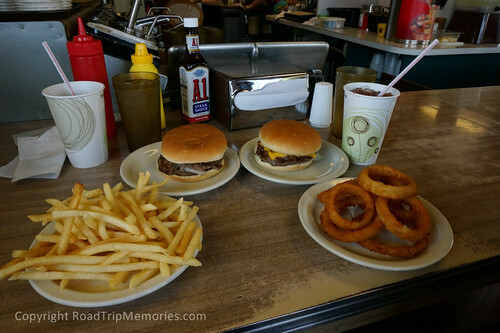 for two of us, we have used the front dinette to eat. Depending upon your needs, you can switch it back and forth, however you want. 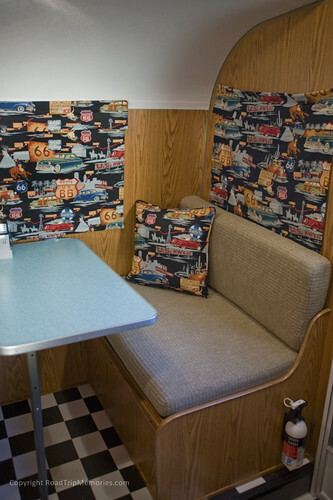 Here is the rear dinette configuration (which was taken with the original beige curtains). And here in bed configuration. 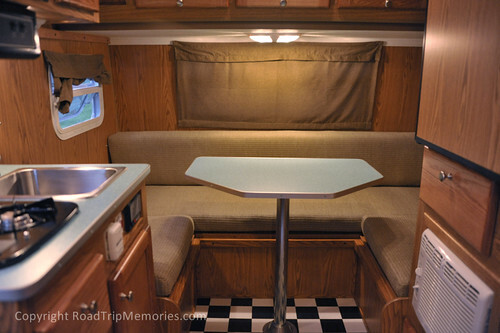 The front dinette also converts into a single bed, and there is storage underneath the booth closest to the door (which is shown in the photo toward the beginning of this post). There is also a shelf and storage behind the other side of the front dinette, as shown in the photo below, and behind the dinette cushion. In addition to the custom interior materials, our HiLander differs from other new models, in that we had the factory add a 110 outlet underneath the front dinette – in the photo above, taken when ours was brand new, it’s not there, but we had it installed just to the right of the converter box. Much more convenient for charging devices, using a laptop, a fan, or small appliance – we have cooked using our Griddler (grill/griddle/panini) or a crock pot, or using our Keurig. Nice addition!! 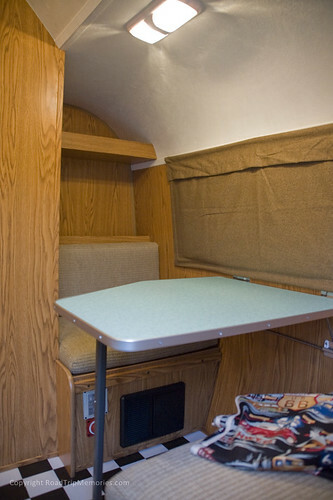 The overhead cabinet (above the rear dinette) also coverts into a single bed, if that works for you. It wasn’t necessary for us, and I used the cabinet space instead. I currently keep my items in “Thirty-one” bags that fit very well inside the cabinets. We will have the mattresses back in the Scotty for its new owner. 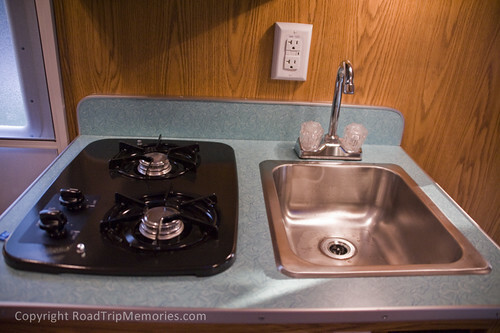 Kitchen features a microwave, two burner cooktop and sink. There’s an overhead cabinet and one below the sink, as well as a bank of drawers, and a fold-up counter top on the side. There’s a GFCI outlet, spice rack, and range hood fan which vents to the outside. We also have a cover that fits over the stovetop to use that space better. 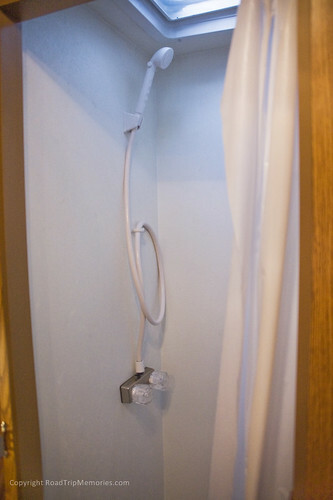 The thermostat, hot water heater switch, and tank / battery monitor panel is located here too. There is also a drawer underneath the 3.0 cu ft fridge. Speaking of the fridge, I requested that the fridge be a 3-way model, so this one runs on battery, electric and propane. I have not used it in propane mode, only battery and electric. There is a freezer compartment inside. The air conditioner is located there, and below that is an access panel which has a small storage area (I put an RV broom and brush/dustpan there). 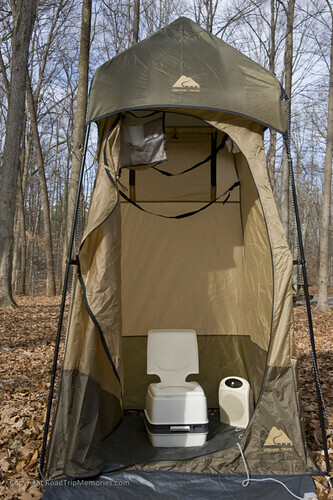 It is equipped with a boomerang antenna and cable TV hookup; however, we did not add a TV ourselves – but there is space for one, along with cable input on the inside and a 12 V outlet. The HiLander features a wet bath (shower & toilet combo). See the specs below for the tank capacities. However, I see that the specs do not reference the hot water heater, which is a standard feature on the HiLander. It’s a standard 6 gallon, DSI gas water heater, and configured to be able to be bypassed during winterization (no antifreeze should ever go into the hot water heater!). We ordered the deluxe package, which includes 5,000 BTU air conditioner (shown above), Fantastic Fan, and 12,000 BTU furnace. Other than testing it, we actually haven’t used the furnace. Instead, we use a small electric space heater when we winter camp. 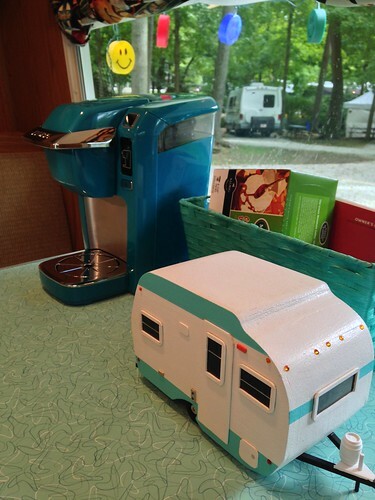 In keeping with the aqua/turquoise color scheme, we coordinated our new Keurig Mini in turquoise with the Scotty…someone even commented that we’re “glamping.” LOL I never thought of it that way, but if you think this retro cool Scotty is glamping, go for it! The little model Scotty (balsa wood) will be included with the trailer. The turquoise Keurig is negotiable. 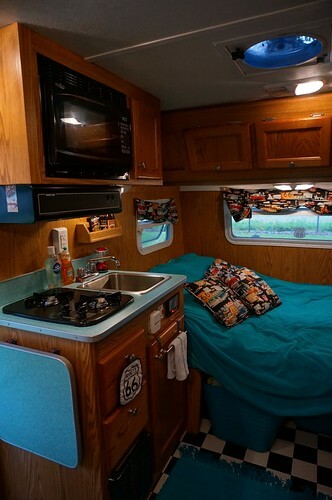 Exterior features a diamond plate rock guard, front window cover, storage (accessible also from the rear dinette). Bumper storage for the sewer hoses. 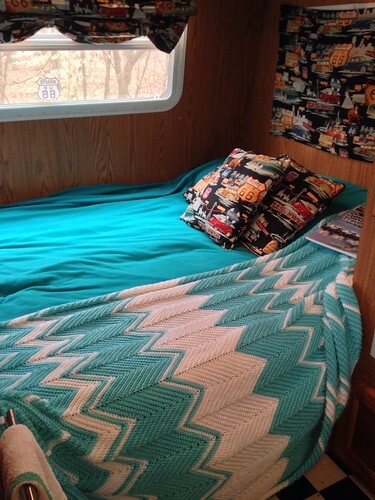 We purchased the coordinating aqua striped 3-pole awning to go with the trailer as well. Here is a slideshow of more photos.If you are on an iOS device or the slide show isn’t visible, click here to view all of the photos on my Flickr site. Here is a link to the Serro Scotty brochure. This weekend we *finally* got the trailer out and camped somewhere other than our own yard! 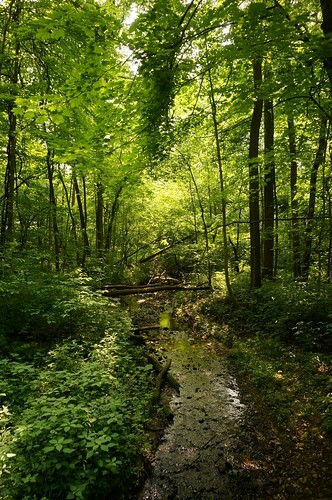 We had reservations at Mounds State Park for Friday and Saturday nights. 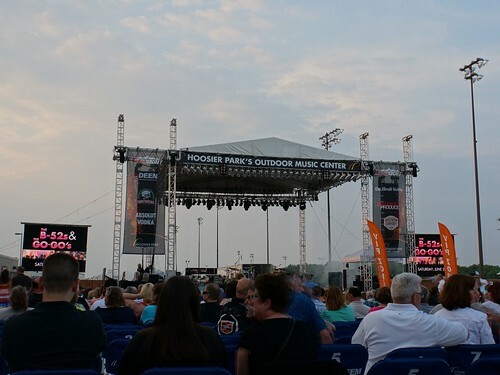 We were going to see Huey Lewis and The News Saturday night at Hoosier Park Casino, and Mounds State Park is a small, but very nice, state park close to the casino. Here was our spot for the weekend, in a small loop right next to the airport. We saw many small planes taking off and landing throughout the weekend. Here are a few photos inside our Serro Scotty, featuring our new turquoise bedding, throw rug, and turquoise storage tubs under the bed. 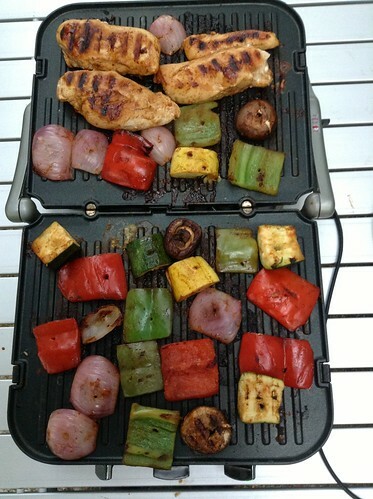 We used our electric grill, the Griddler, to make a reasonably healthy dinner Friday, chipotle lime chicken and grilled veggies. 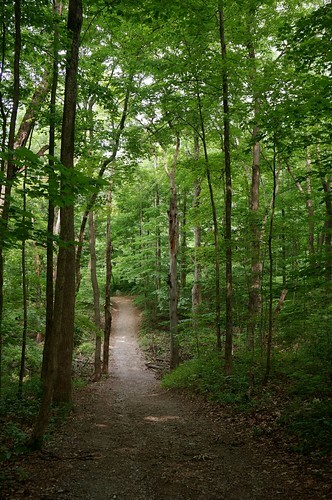 On Saturday morning we went for a 3 mile walk around trail 5 that loops the entire park, and also a bit of trail 1, that goes by the mounds. 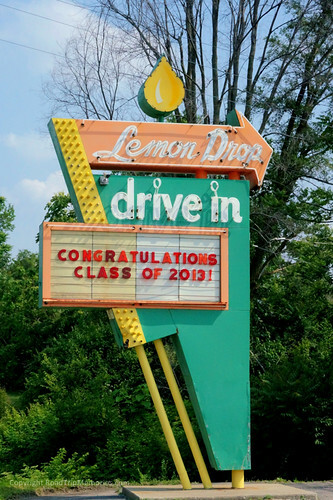 After our walk, we relaxed around the campsite for a while, then we went out to an early dinner at the nearby Lemon Drop Drive-in and had onion burgers – yummm. 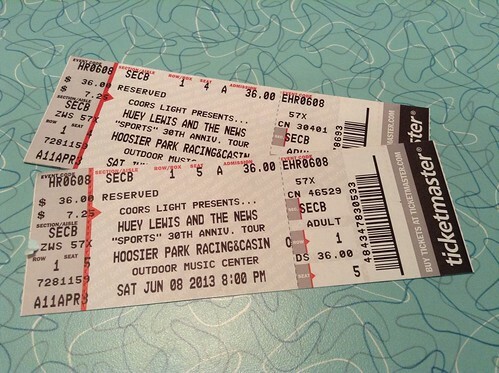 We went back to the campground to get cleaned up for the reason we were in Anderson – to go see the band, Huey Lewis and The News. They are celebrating the 30th Anniversary of their hit album “Sports” with a tour and we thought it would be fun to go see them at the Hoosier Park Casino. 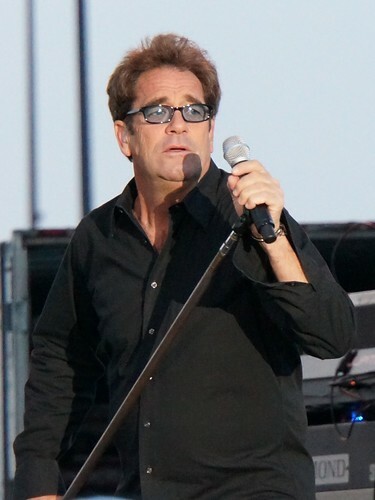 I’d seen alot of popular bands back in the 80’s, but not Huey Lewis. I thought about so many of his songs and liked them all, so why not? Why not indeed…the show was terrific. 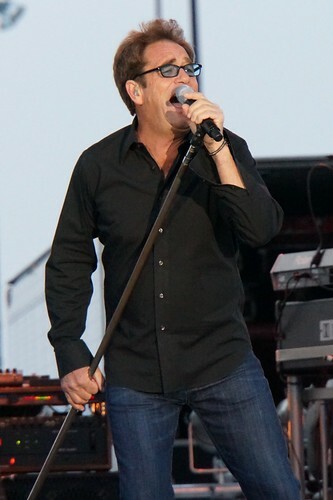 Huey Lewis sounds excellent, exactly the same as he did back in the 80’s. He puts on a very good, entertaining show and I recommend anyone who likes his music to go see them. 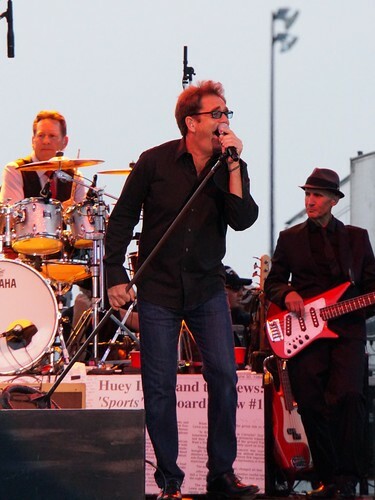 The main attraction – Huey Lewis and The News! Below is a slideshow of the weekend’s photos. Season’s Greetings, Happy Holidays, and Merry Christmas! 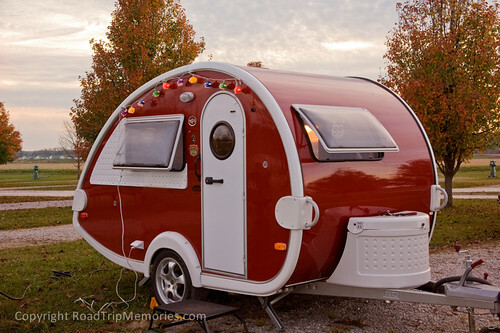 Here’s hoping Santa brought you plenty of new camping gear for 2012, and maybe even a new trailer for those of you who’ve been extra nice! Our Serro Scotty HiLander’s maiden voyage! 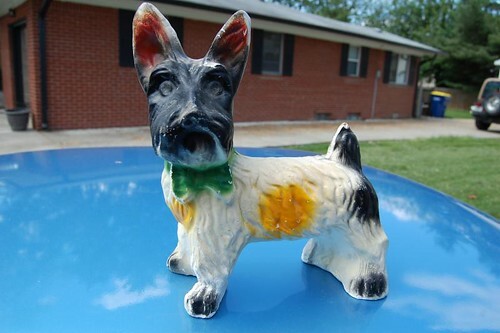 Many folks who have vintage Serro Scotty trailers also have a Scottish Terrier for a pet. Why not? 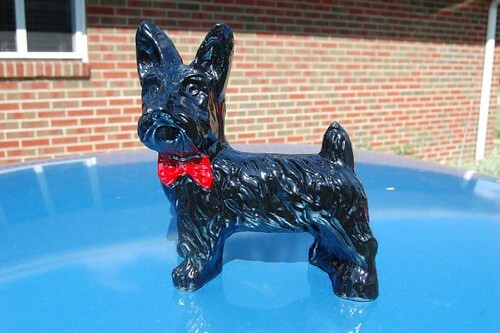 The Scotty trailers have adorned a black terrier in their logo since the early stages of the company’s existence in the late 1950’s. Winton will be with us on all our future trips in our Scotty, and will find himself sitting under the awning watching the world go by…just don’t offer to play fetch!